The detective is back and has defeated the imposter detective. Just like the original press release from Central City Brewers & Distillers stated “In a city where corruption and crime rule all, justice is brewing”. This Surrey brewery found its own corruption when the original artist for the label failed in being original with their design. “Detective Saison” is back and has fought off the corruption of the once rich township of Central City. The beer pours a light golden straw colour with a white head. The aroma consist of wheat, yeast, pepper and citrus. The flavour is of yeast, wheat, citrus, citrus rind, peppercorns, bready malts and a crisp finish. The alcohol content comes in at 6%. It is unlikley that you will find the imposter but you will find the real detective in stores now! This is a well made sasion and well worth picking up. 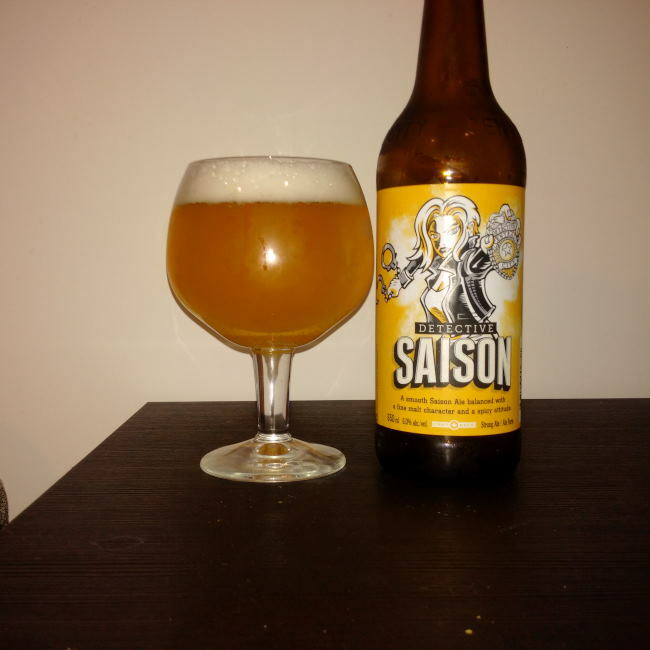 Commercial Description: Detective Saison is the first character-based beer to be introduced, amidst the dirt and weeds sullying the streets of Central City. A breath of fresh air to the city’s moral compass, Detective Saison is a smooth, dry, classic French Saison-style wheat ale, balanced with a fine malt character and a spicy attitude with the added complexity of pink peppercorns. A witty intellect, Detective Saison has an iron constitution about right and wrong and her pursuit of truth and justice is unrelenting. This entry was posted in Saison and tagged bc, bread malt, bread malts, bready, bready malts, canada, central city brewers & distillers, central city brewers and distillers, citrus, citrus rind, crisp, detective saison, pepper, peppercorns, surrey, wheat, yeast, yeasty.